Profile: Dr. Kevin Noonan grew up in Newfoundland, Canada and completed his Bachelor's degree from Dalhousie University in Halifax in 2003. 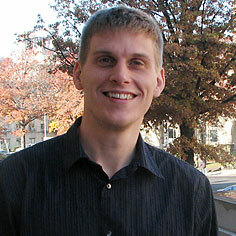 He moved to British Columbia two months later to begin his PhD under the supervision of Prof. Derek Gates. He worked on the synthesis and living polymerization of phosphaalkene molecules. From there, he worked as a postdoctoral fellow with Geoffrey Coates at Cornell on Anion Exchange Membranes for Fuel Cell applications. He started at Carnegie Mellon in August 2011 as an Assistant Professor looking to design new ligands in catalysis and to develop new monomers for polymer synthesis. When not in the lab or the office he likes to run and play volleyball. Abstract: Conjugated polymers are a highly interesting class of materials: they can display metallic conductivity upon doping, act as semiconductors, or they can be used as light emitters. These macromolecules are typically synthesized in a step-growth fashion using metal catalyzed cross-coupling techniques however, chain-growth methods are possible using catalyst-transfer polycondensation (CTP). Chain growth offers the opportunity to prepare new materials that are inaccessible using step-growth techniques. In this presentation, we will discuss some of our recent work constructing conjugated polymers with well-defined monomer compositions along the backbone using CTP. We will also discuss how these materials compare to random polymers with the same building blocks. Sometime will also be dedicated to our work on furan and incorporating this building block into conjugated architectures. Furan is a highly attractive monomer for polymerization since it can be obtained from biomass. Furan-based materials also have a host of desirable properties as compared to their group 16 analogues including: increased solubility, higher fluorescence and a lower propensity to twist in the solid-state. While these features make furan an attractive precursor, only a few reports have discussed polyfurans in detail. Furan-based monomers can often present different synthetic challenges and there is significant suspicion that they are unstable. If time permits, we will discuss some of our work on polyelectrolytes based on phosphonium materials for fuel cells.